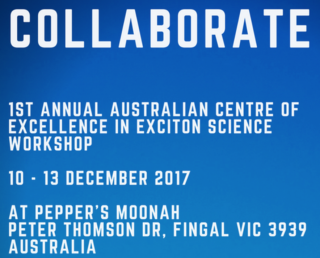 The 1st An­nual Aus­tra­li­an Re­se­arch Coun­cil Cent­re for Ex­cel­len­ce in Ex­ci­ton Sci­en­ce aims to bring to­ge­ther our mul­ti-di­sc­p­li­na­ry team of re­se­ar­chers to dis­cuss, en­ga­ge, dis­co­ver and learn how the Cent­re in­tends to achie­ve bet­ter en­er­gy ef­fi­ci­en­cy. The Buil­ding Art In­ven­ti­on re­se­arch group at the de­part­ment of Ar­chi­tec­tu­re, Ur­ban- and Land­s­ca­pe Plan­ning, Uni­ver­si­ty of Kas­sel, Ger­ma­ny con­ducts re­se­arch at the in­tersec­ti­on of vi­sual arts, ar­chi­tec­tu­re, ur­ban plan­ning, in­du­s­trial- and in­ter­ac­ti­on de­sign, ex­pe­ri­men­tal phy­sics, di­gi­tal fa­bri­ca­ti­on and ma­te­rial sci­en­ce and ap­p­lies that know­led­ge to ar­chi­tec­tu­re, span­ning the full ran­ge from na­no­me­ter to buil­ding sca­le. Cur­rent re­se­arch con­cerns the de­ve­lop­ment of high­ly in­no­va­ti­ve func­tio­nal buil­ding ma­te­rials and con­cepts, such as ‘Touch­c­re­te’ (touch-sen­si­ti­ve con­c­re­te), ‘Bling­c­re­te’ (re­tro-re­f­lec­ting con­c­re­te sur­faces) and ‘Dy­sC­re­te’ (en­er­gy ge­ne­ra­ting con­c­re­te). The lat­ter en­tails the in­te­g­ra­ti­on of dye-sen­si­ti­zed so­lar cells (DSCs), an emer­ging thin-film pho­to­vo­latic tech­no­lo­gy, in­to pre­fa­bri­ca­ted con­c­re­te seg­ments. Areas of ap­p­li­ca­ti­on in­clu­de ar­chi­tec­tu­ral and pro­duct de­sign, as well as di­gi­tal fa­bri­ca­ti­on and con­struc­ti­on.